"I've been working out with LeighAnne in McKinney on M/W/F at 6:00 am for almost 8 weeks. I've enjoyed being able to just show up and someone else has already put together a fantastic workout. No planning required! It is a different workout every time and I'm always exhausted by the end of the hour. Every time I show up I wonder, "what will we be doing today?". 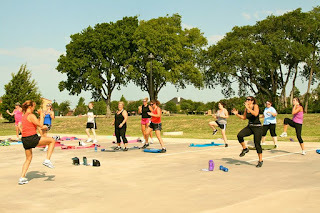 Before I started with Texas Fit Chicks I had gotten out of the habit of working out. If I did workout it was typically just cardio (no strength training) The program has provided great cardio AND strength training workouts. It has also provided much needed accountability. After my first 5 weeks I had lost over 10" and almost 2% body fat. You can't argue with results! I would (and have) recommend it to my friends!"